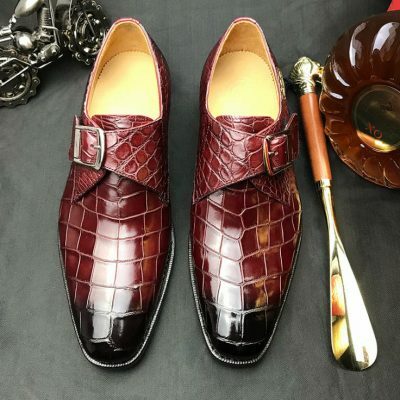 Alligator shoes, crocodile shoes for sale, all our men’s alligator shoes, crocodile shoes, alligator loafers, crocodile loafers, alligator sneakers and crocodile sneakers are free shipping worldwide. 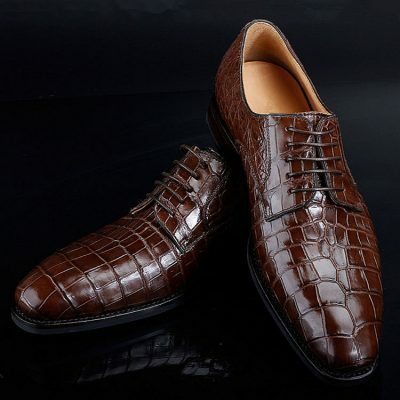 We only offer high-quality and high-end genuine alligator leather shoes and crocodile leather shoes to our customers. 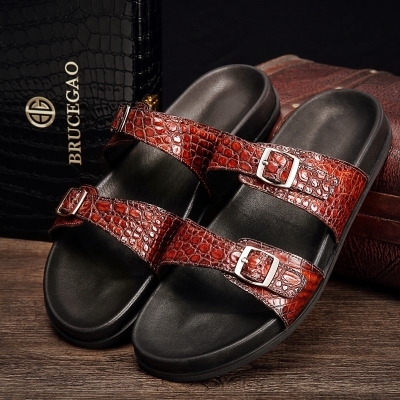 BRUCEGO’s alligator shoes and crocodile shoes are not ordinary shoes. 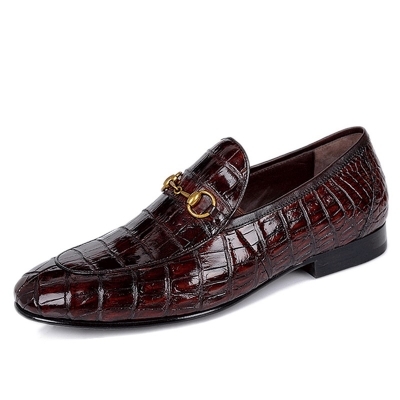 They are made of genuine alligator and crocodile skin that will surely last for many years. 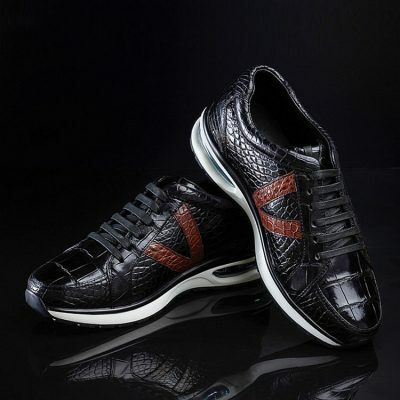 They are the shoes of choice for elites and fashionable people, and those searching for an investment piece. 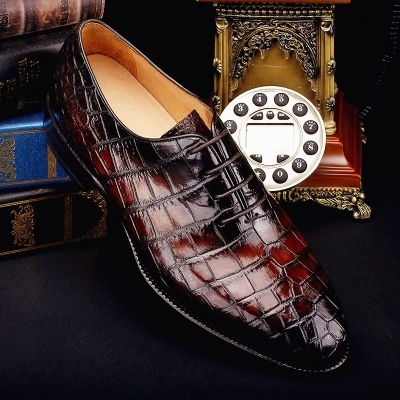 Shoes from alligator and crocodile skin are a symbol of status and wealth. 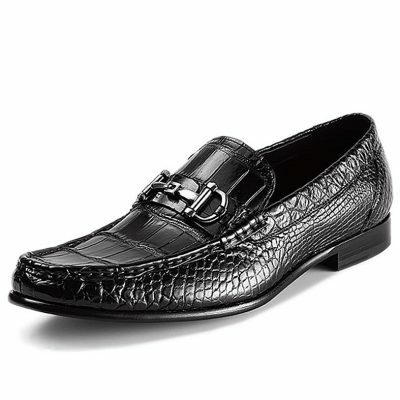 The feel of the shoe is irresistible to touch which arouses a sensation of prosperity and class. 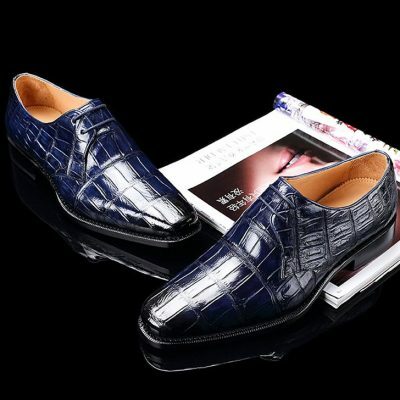 In a social setting, the alligator shoes and crocodile shoes are highly respected than anything else. 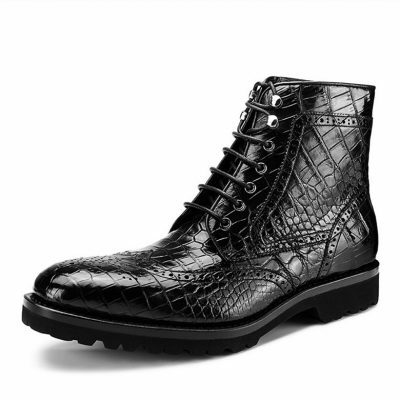 Regarding money, they are costly but worth every penny. 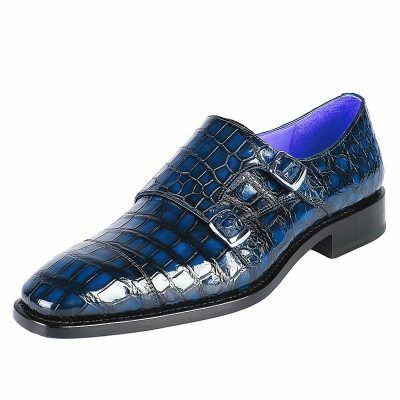 Gentlemen, do you like to put a little pep into the step? 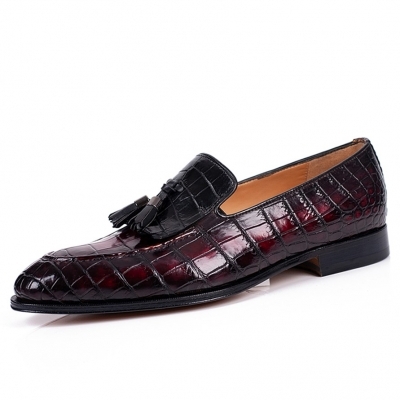 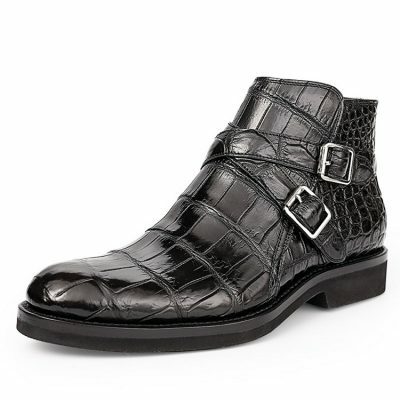 Then noble alligator skin shoes or crocodile skin shoes are precisely what you are searching for. 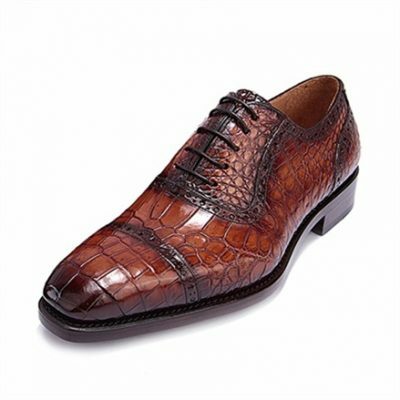 A pair of shoes made to surround your feet in comfortable handsome alligator skin or crocodile skin will polish any classic appearance. 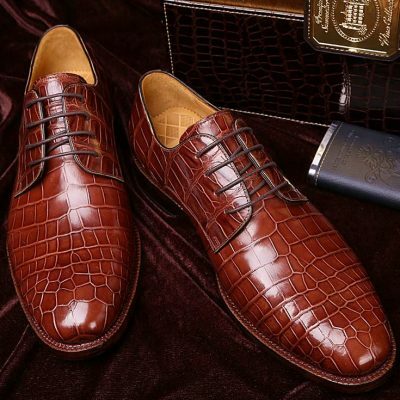 Genuine alligator skin shoes and crocodile skin shoes are regarded to be the most excellent material for creating shoes, and these authentic alligator skin shoes have long-lasting wear, durability, and strength. 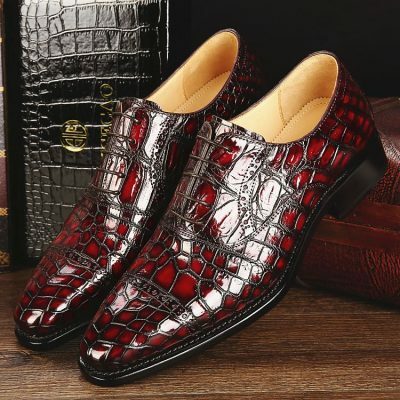 When you have own or have heard about alligator skin shoes or crocodile skin shoes then you must know that it is a superb and exotic pair of shoes which is an expensive addition to your shoe collection. 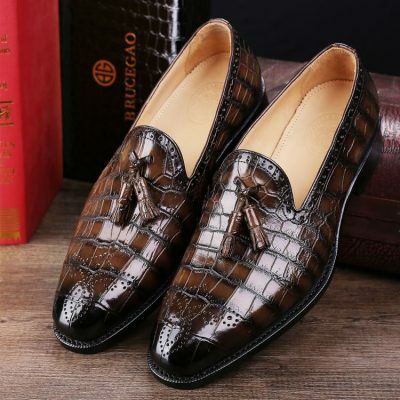 Nowadays, alligator skin shoes and crocodile skin shoes are made, created as well as tried to cater to specific demands of comfort as well as add to your style. 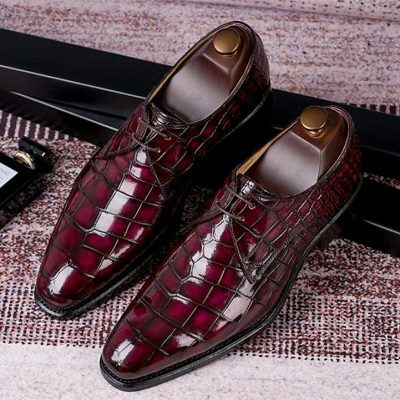 These shoes are individually exceptional, no two pairs of alligator shoes are similar or alike, and the inner or outer part of this style of shoe is made of soft leathers to provide an excellent comfort when used. 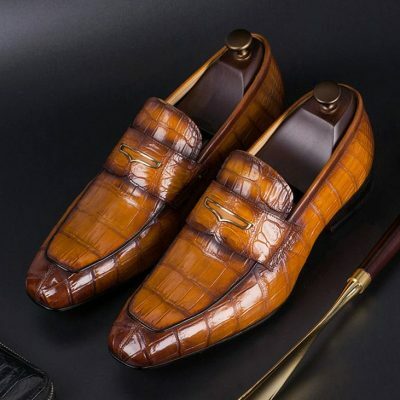 These kinds of shoes are a bit above your regular shoes, and they are relatively costly and could show affluence as well as wealth amongst successful people. 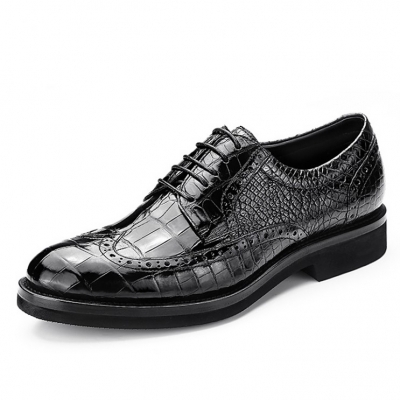 Fashion often changes, however one type of shoe which is remained a significant symbol is leather. 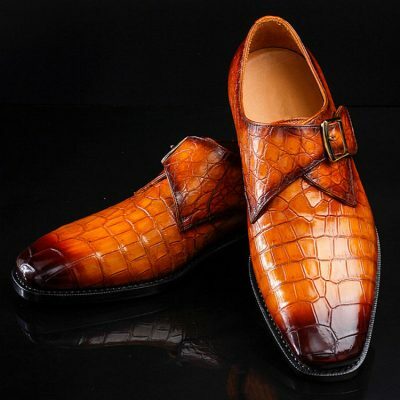 Leathers from exotic reptiles like alligator skin and crocodile skin, all differ in cost, appearance as well as texture. 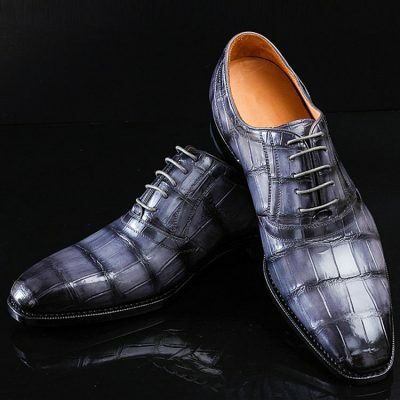 Of the diverse kinds of leathers from reptiles, crocodile skin isn’t common and is likely to be extremely costly. 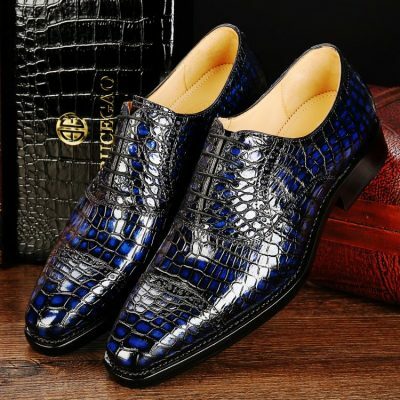 Due to this factor, a lot of shoe manufacturers and vendors try to market low-quality leathers as crocodile and boost the price. 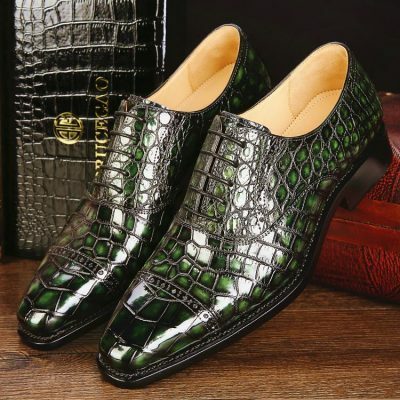 So, it is essential that you know what to search for in a pair of crocodile shoes and which you know how to differentiate between the face and the genuine. 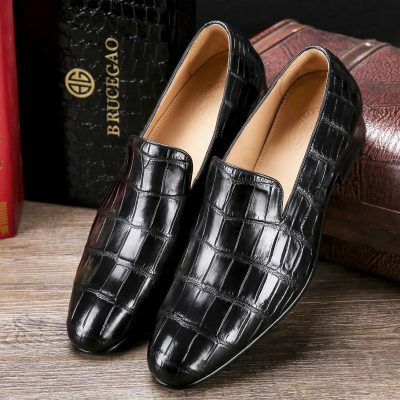 At BRUCEGAO’s online store, please rest assured that our alligator shoes and crocodile shoes 100% guarantee genuine crocodile or alligator skin. 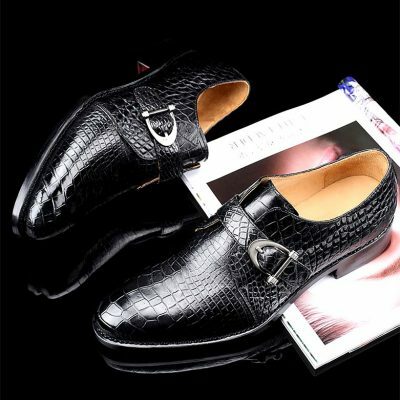 Our alligator shoes and crocodile shoes are hand-stitched and handmade; this assures you that your uniqueness and exceptionality is sustained. 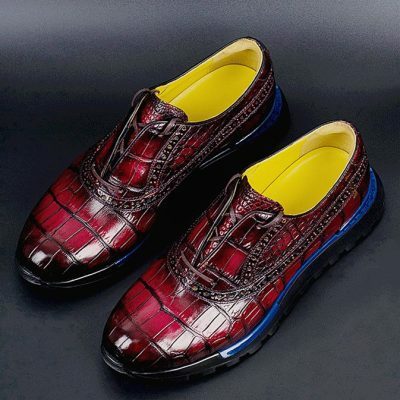 Fashion truly comes and goes. 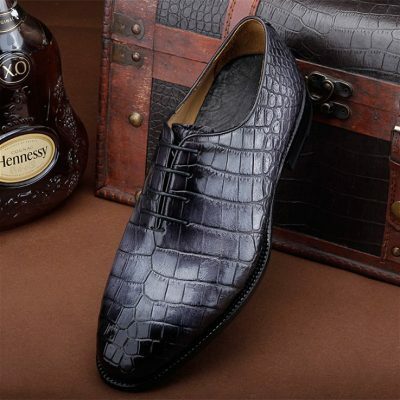 Nevertheless, one of the styles of shoe that continue to remain as a status symbol is none other than an exotic leather. Exotic leather like alligator skin and crocodile skin vary in cost, texture, and appearance. 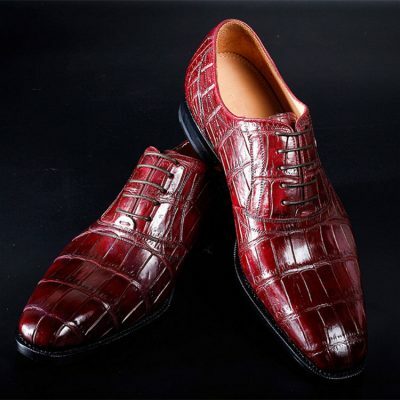 Of the different types of reptile leather, alligator skin and crocodile skin are both expensive. 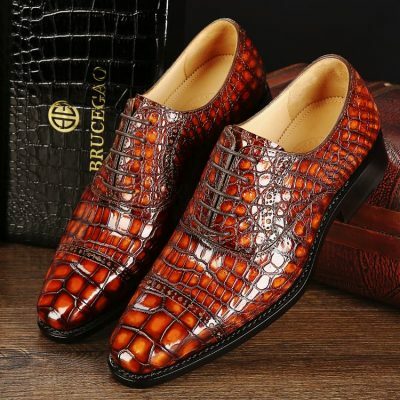 Due to this very reason, a lot of shoe sellers market fewer quality leathers as the alligator and crocodile skin increases the price. 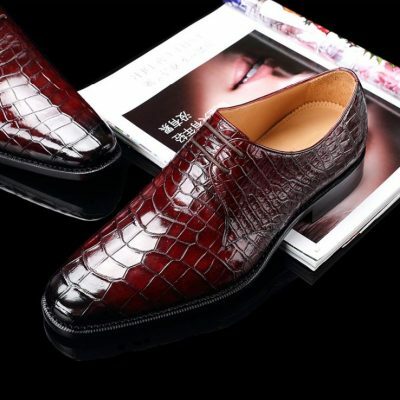 Thus, it is necessary for you to consider a few things before looking for a pair of alligator shoes or crocodile shoes. 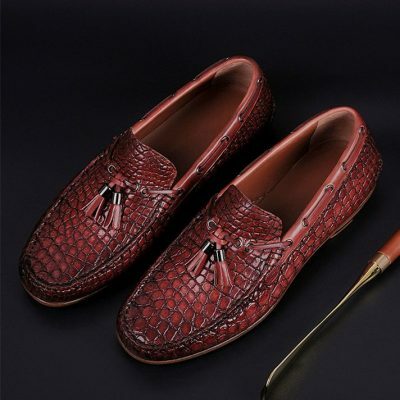 In this way, you will be able to know if a pair of shoes is 100% real and authentic. 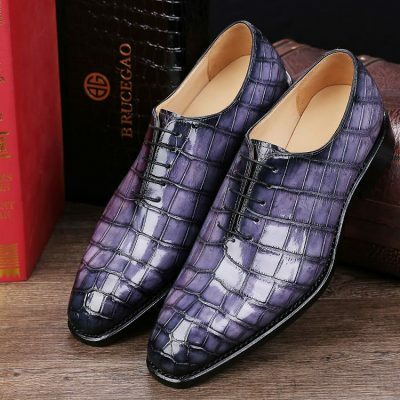 When you buy authentic alligator shoes or crocodile shoes, you need to choose only a pair that best matches your unique preference. 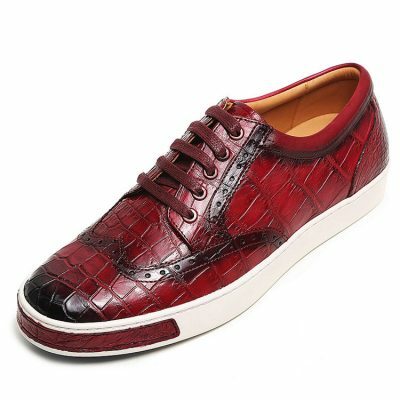 These shoes have been made available in different patterns and colors. 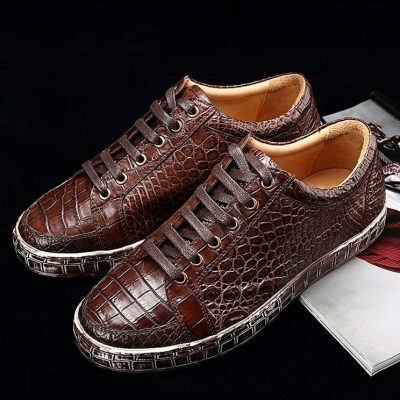 You must make an effort to choose a pair that best appeals to you. 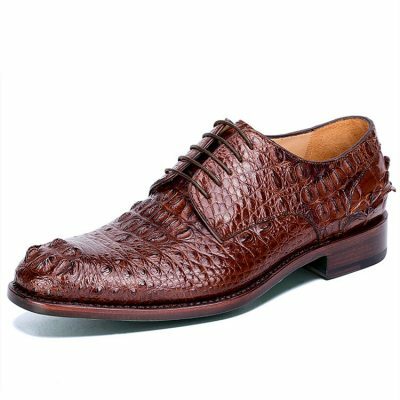 In the alligator appearance, search for symmetry in that so-called patterns of scales. 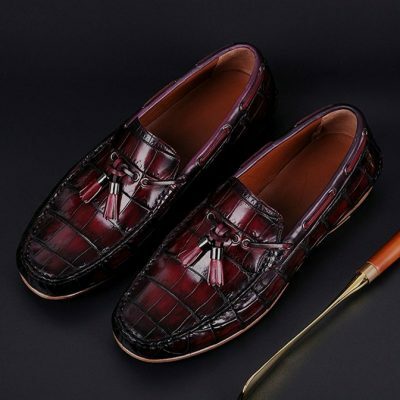 Even if this may not seem necessary, it still shows a level of care in the manufacture of the alligator shoes. 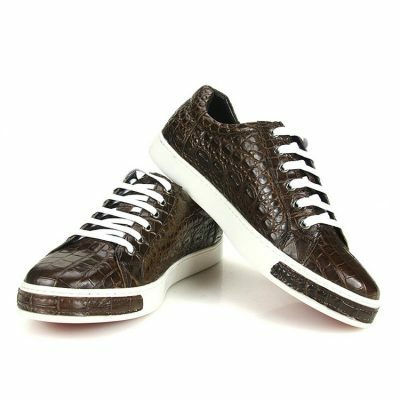 This will have a direct link to the product quality that you have received. 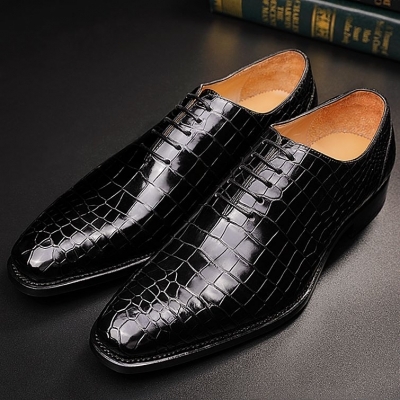 When you shop for alligator shoes, you will see other sellers that pass off the embossed leather as an authentic alligator. 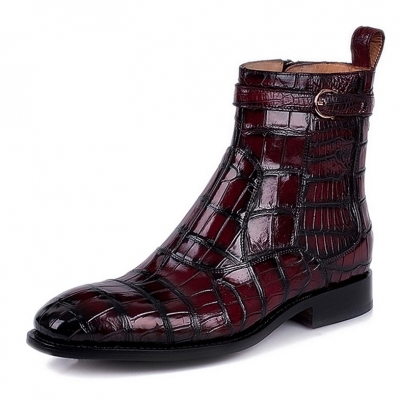 Some make an effort to use cheap leather that will look exactly just like the alligator leather. 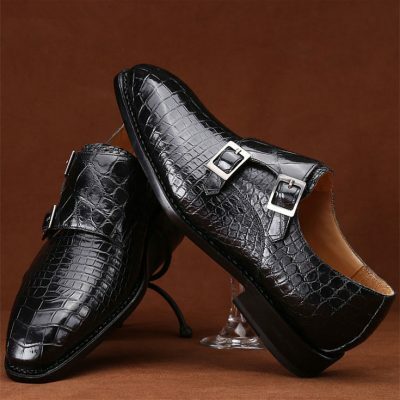 Some manufacturers take non-exotic and standard leather and make use of a machine that will emboss scales. 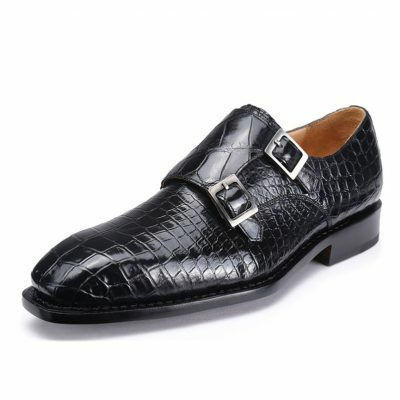 Prior to the fake scales, these can easily be identified by a uniform pattern of sizes and shapes. 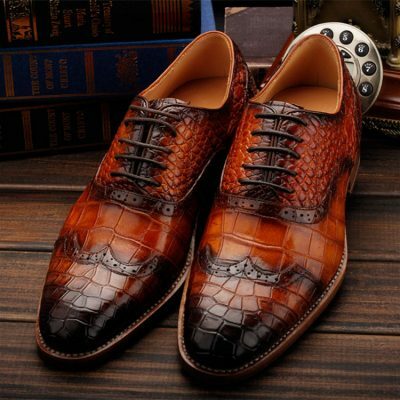 The actual scales of the alligator are unique in size and shape. 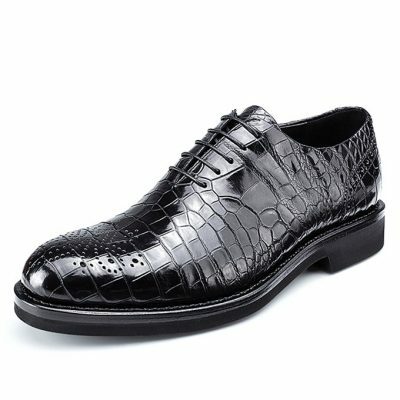 Regarding alligator shoes, you must bear in mind that the ones that are exactly real and authentic feature a small pore. 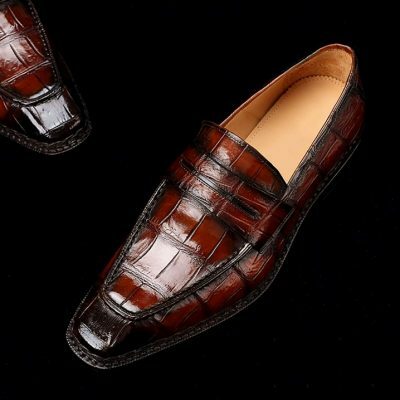 If this simply cannot be seen, it might mean that the pair of alligator shoes you have is not pure and authentic. 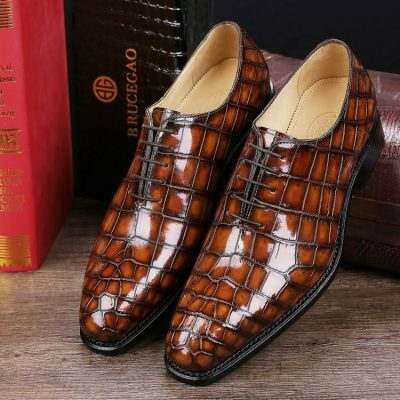 You must bear in mind that alligator shoes are 100% authentic if there is a diamond-shaped umbilical scar that is featured. 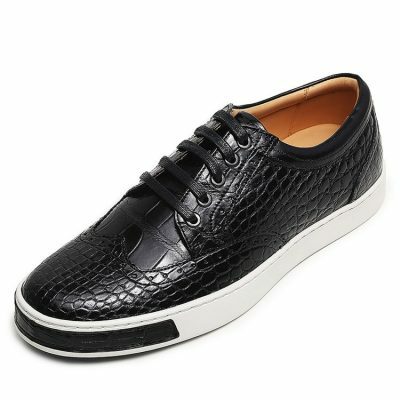 This diamond shape usually consists of small triangle scales. And, the price of the alligator shoes is usually high. 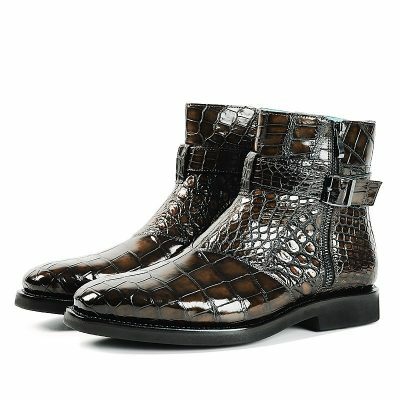 If ever you find a pair that is affordable in price, it might mean that it is not a good and high-quality one. 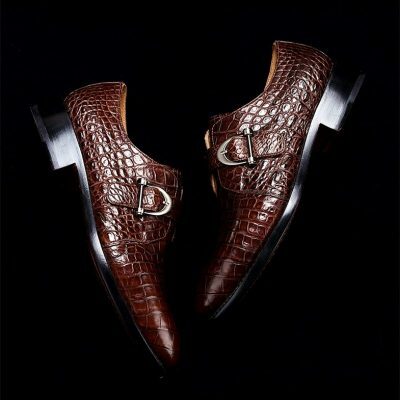 A good pair of choose must be one that lasts a lifetime, do you not think so? 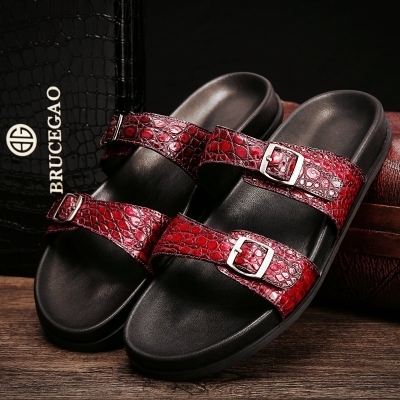 BRUCEGAO has this kind of thinking, and that is why they offer the best selection of alligator shoes, crocodile shoes, and other exotic footwear. 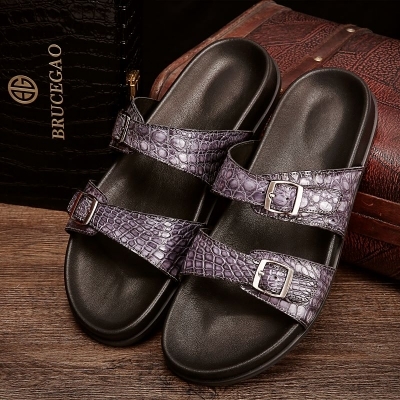 They take pride in providing quality footwear for both men and women so that they can invest their money in something that will last for a long time. 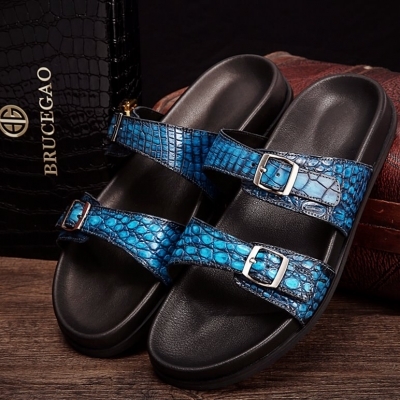 There are many reasons that make BRUCEGAO the best choice when looking for shoes that would last a lifetime. 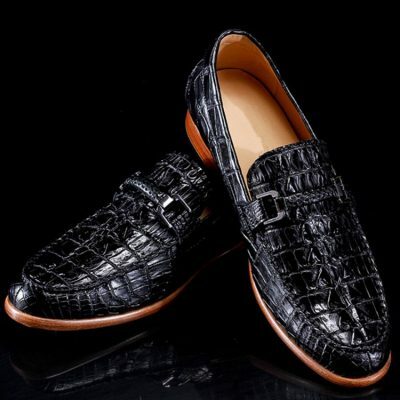 At number one, there is the fact that they offer alligator and crocodile shoes, footwear made of reptile skins. Now, what do you know about reptile skins? 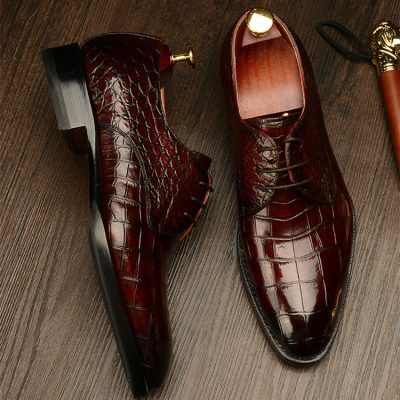 Such leathers are among the most beautiful type of leather on this Earth. 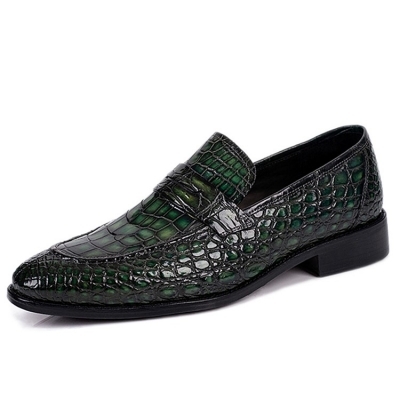 Reptile skins like alligator and crocodile leather are what they say as ‘true marvel of the natural world’. 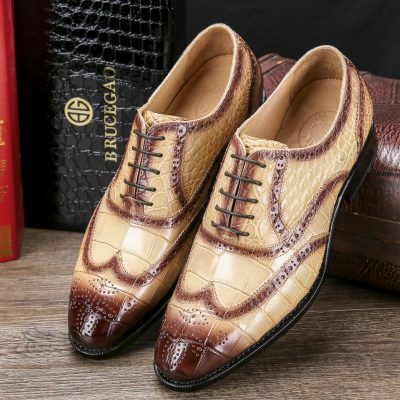 They come in wide array of colors, textures, and patterns that the sheer diversity of it offers you nearly an endless selection of possible shoe designs. 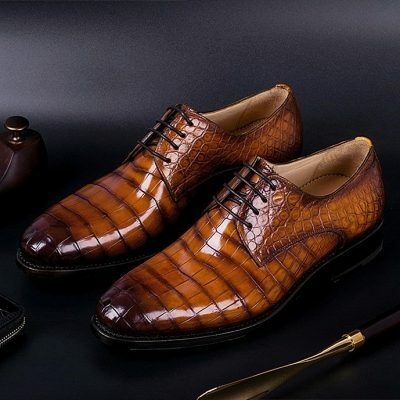 When you use calfskin for leather, often you rely on antiquing techniques as well as finishing using polishes and dyes. 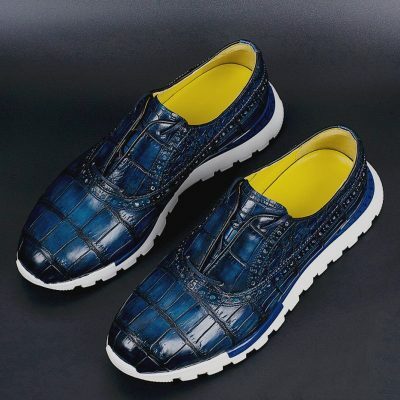 However, BRUCEGAO’s alligator and crocodile shoes are not like this. 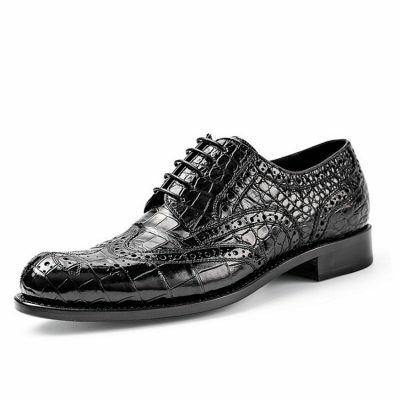 These shoes result from nature’s evolution and artistry. 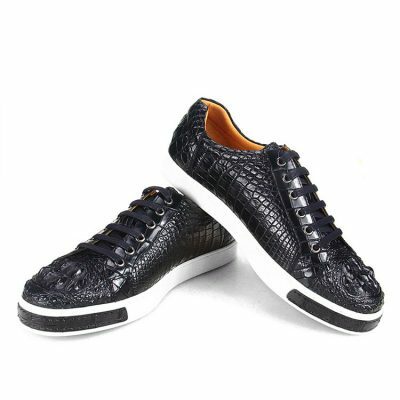 BRUCEGAO sourced high-quality alligator and crocodile skins from verified farms, ensuring they are high quality and not fake. BRUCEGAO never and will never use alligator and crocodile skins from unverified sources. 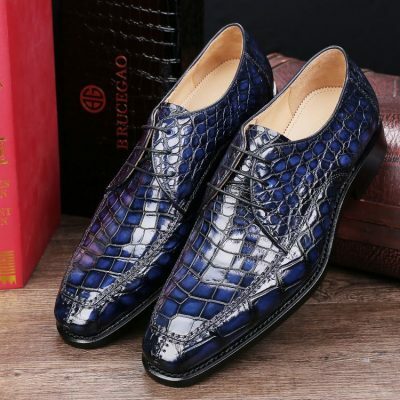 BRUCEGAO’s alligator and crocodile shoes came from reptile skins, of alligator and crocodile, two of the extraordinary exotic leathers ever used for shoes and other products. 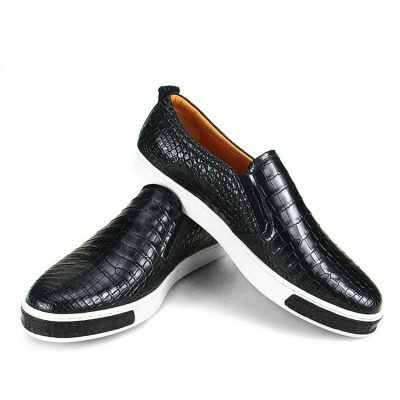 Crocodiles and alligators both have tough skin, a quality they pass to shoes made out of them. 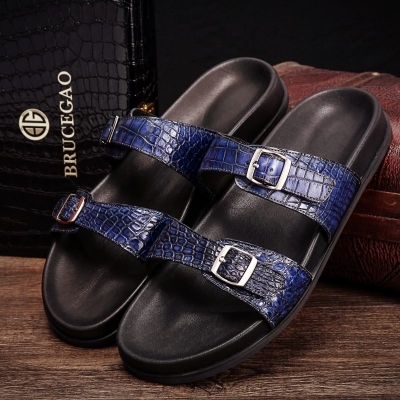 Thus, you can expect your alligator and crocodile shoes from BRUCEGAO to be extremely tough and durable. 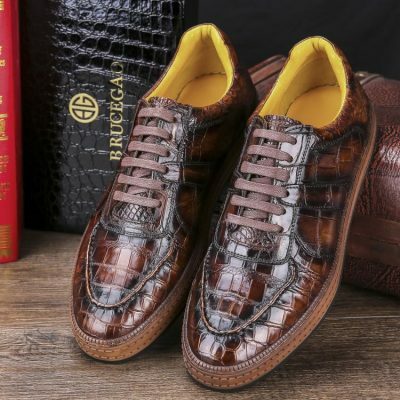 As mentioned before, BRUCEGAO exotic shoes last a lifetime. 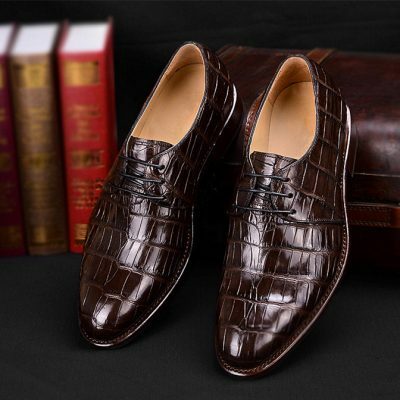 That is because alligator and crocodile hides are nearly indestructible, the reason why they often use such leather skins for shoes as well as other leather products. 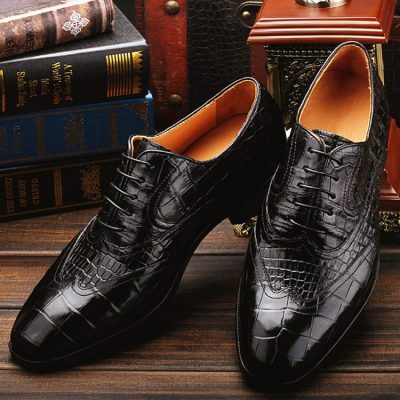 Indeed, alligator shoes and crocodile shoes are tough, highly durable and capable of withstanding harsh conditions. 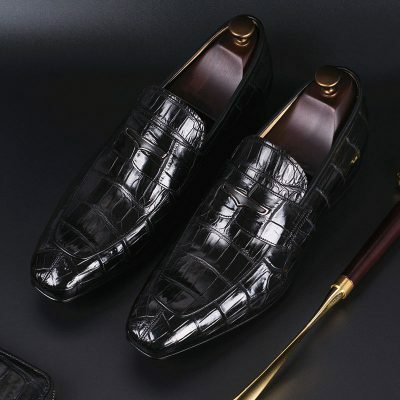 Not a single person can easily dismiss the beauty and practicality of BRUCEGAO alligator and crocodile shoes. 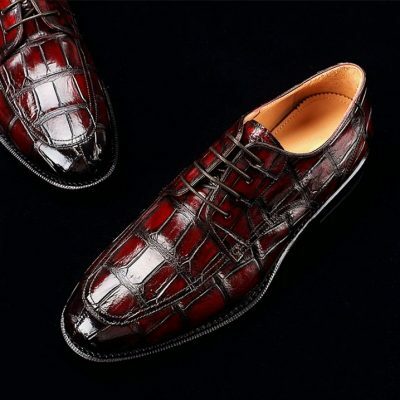 Made from predatory animals with one of the toughest skins, one easily perceives it to be extraordinary when wearing such alligator or crocodile shoes. 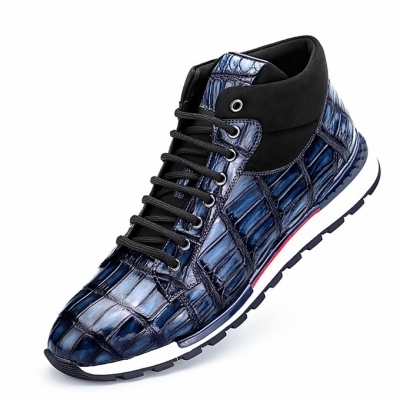 In fact, wearing one of BRUCEGAO’s shoes automatically let you take advantage of the instant status symbol. 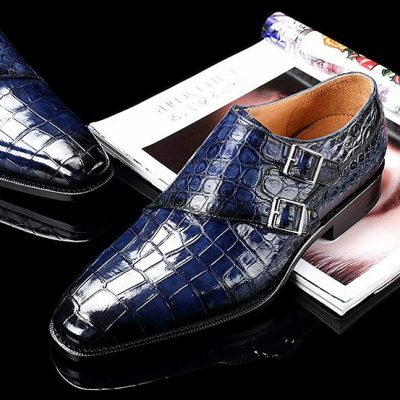 The toughness, high durability, rarity and style that BRUCEGAO alligator and crocodile shoes offer to make it so much famous. 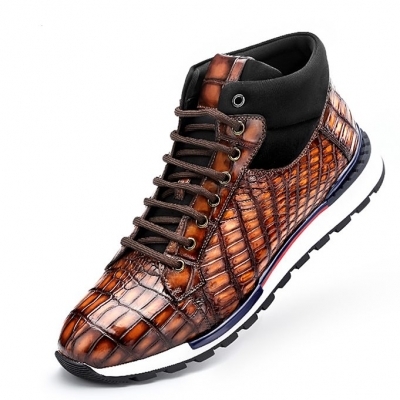 It gives you the capacity to withstand the damage of harsh weather just like how their skins protect crocodiles and alligators in the wild. 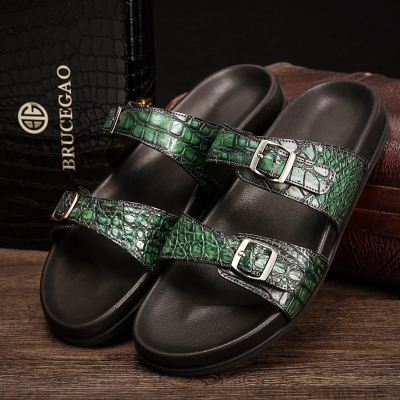 BRUCEGAO alligator shoes and crocodile shoes make use of authentic reptile skins from verified, safe sources. With that, you can rest easy and take advantage of the benefits that exotic leather shoes readily offers. 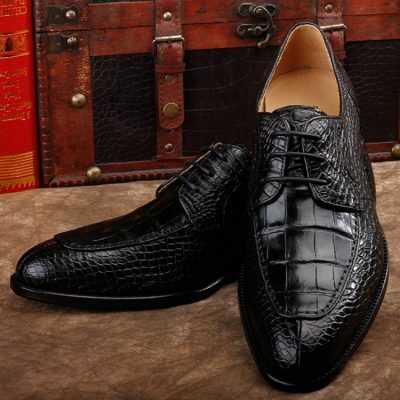 Alligator and crocodile skin is considered to be one of the most luxurious and beautiful leathers available. 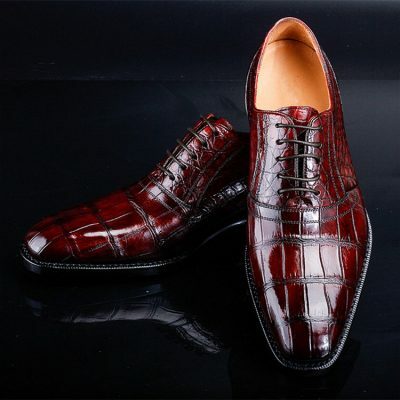 It is an exceptional material and needs proper care to keep in good shape. 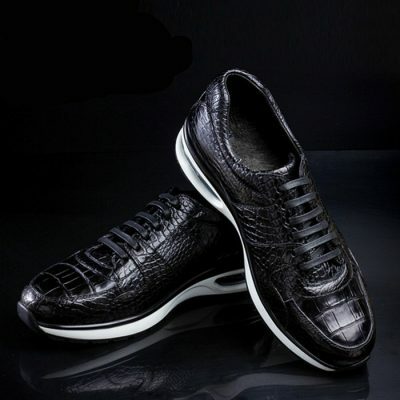 Without proper care, the appearance and flexibility of alligator and crocodile leather diminish radically. 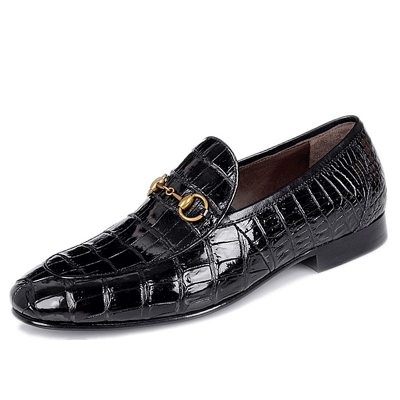 With a number of special care, however, the crocodile shoes must last for many years. 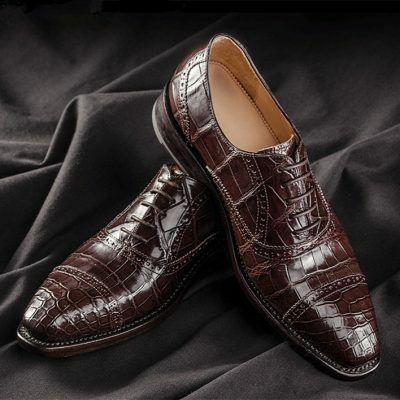 Caring for crocodile shoes could be separated into two essential categories: damage prevention as well as maintenance. 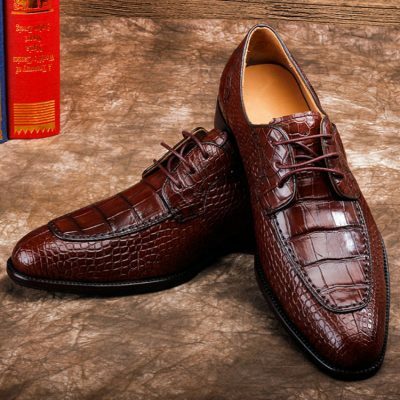 Damage Prevention: Avoid rain or direct sunlight, as both could harm your alligator shoes. 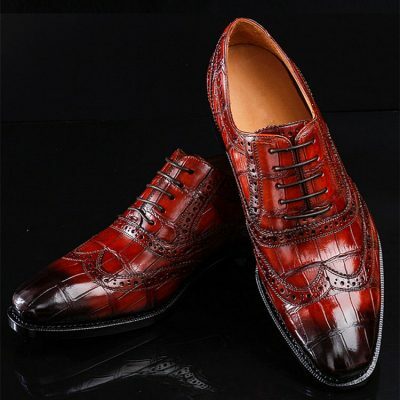 Direct sunlight or any direct source of heat could cause damage to your shoes and loss of natural sheen. 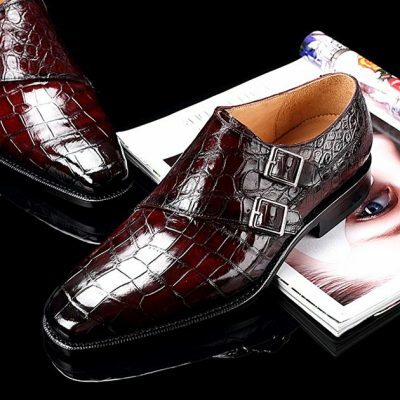 Water could damage your alligator shoes as this could cause your shoe to crack. 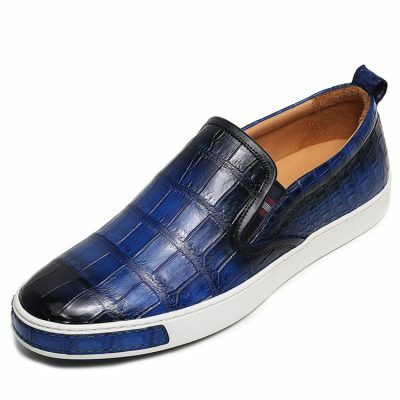 Once you alligator shoe gets wet, you need to dry them lightly with an absorbent, soft cloth. 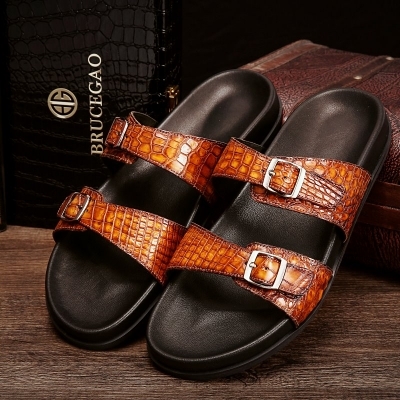 Afterward, leave your shoes to air dry naturally. 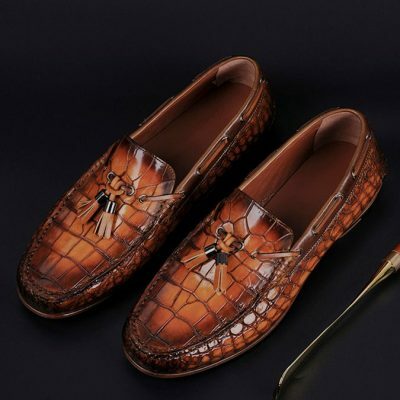 Proper Care: Caring for alligator shoes and crocodile shoes are very essential. Maintenance is not hard to perform, and almost not takes time at all. 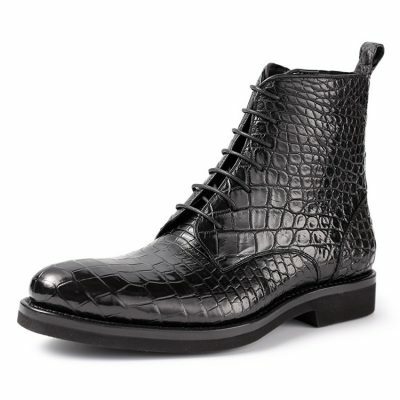 Proper maintenance will assist to preserve the leather as well as stay in excellent condition. 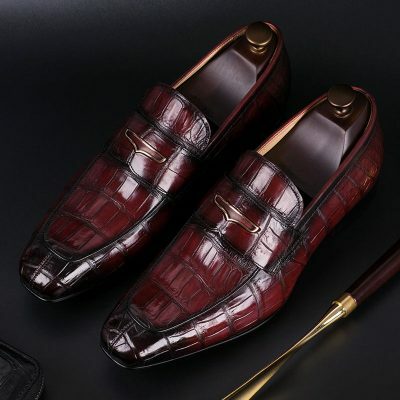 With regards to caring for the alligator shoes, you should always make sure to utilize the right cleaning products and materials which are intended particularly for alligator leather. 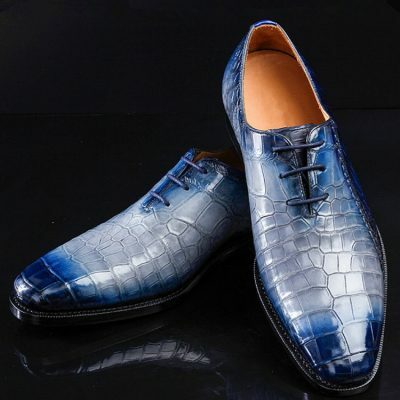 Ruthless or harsh chemicals could damage your shoes and also darken its color. 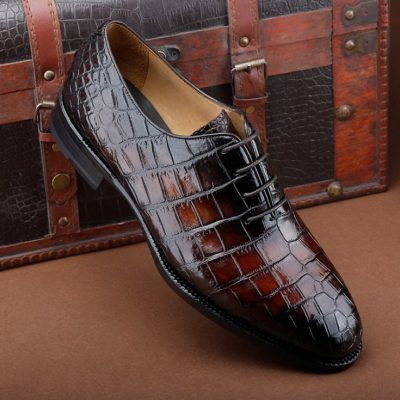 As much as possible avoid treating alligator shoes with products which are planned for ostrich leather. 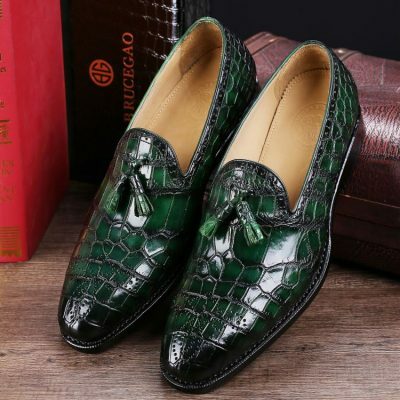 You need to clean your alligator shoes and crocodile shoes using a soft cloth as well as small liquid prior to applying moisturizer. 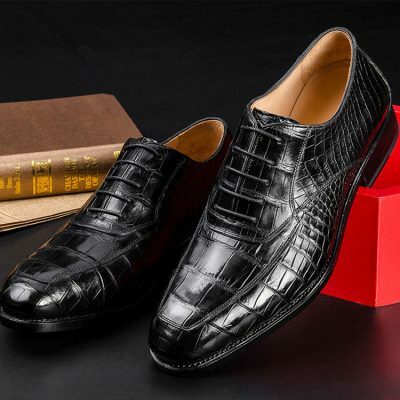 While alligator shoes are durable and tough, without right care, in due course the leather’s appearance and flexibility will diminish. 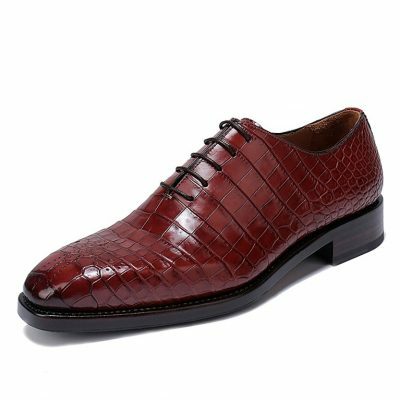 If utilizing any conditioning products or cleaners, you have to try them first in a subtle place to know how the alligator leather reacts. 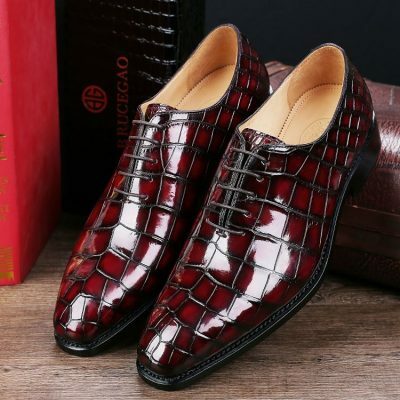 Besides, you need to remember that while shine or polish will improve the shine, compounds and oils in the alligator shoe should be replaced at regular intervals to keep your shoes looking like brand new again. 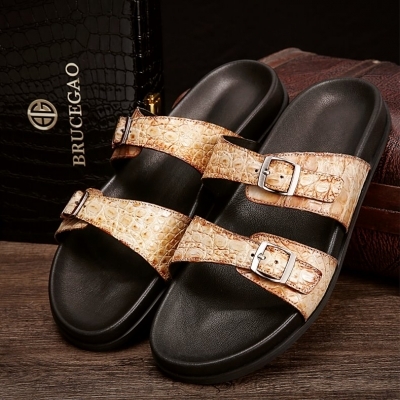 With regards to replenishing, it’s essential to utilize a conditioner which is intended for alligator, one which will top up the oils and put in water resistance. 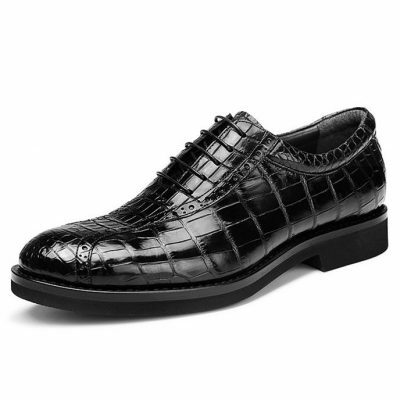 One advisable product which works very well for alligator shoes is beeswax. 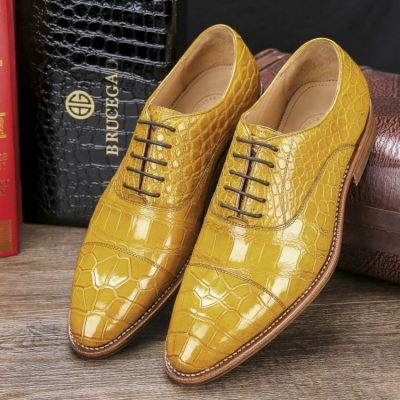 Put a light coating of additional fine beeswax to your alligator, then slowly rub this beeswax into your shoes and frivolously buff it. 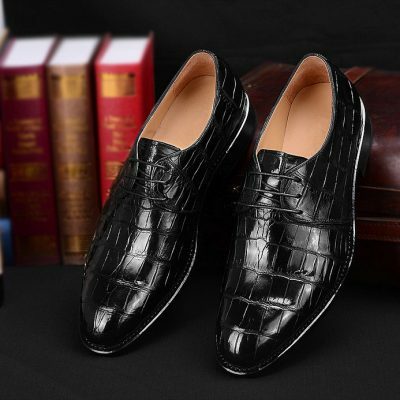 You need to make sure to take good care of your alligator shoes properly in advance because once it cracks, it is too late. 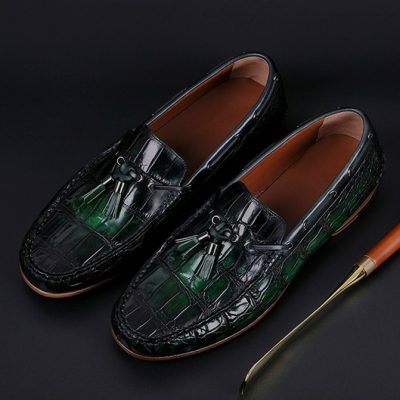 Maintenance, as well as damage prevention, could assist to extend the life of your alligator shoes and crocodile shoes, assisting it to last for many years as well as look great and amazing. 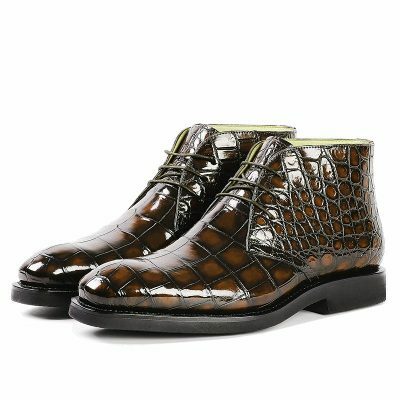 Tags: alligator shoes, crocodile shoes, crocodile skin shoes, alligator skin shoes, crocodile leather shoes, alligator leather shoes, genuine crocodile shoes, genuine alligator shoes, men’s crocodile shoes, crocodile dress shoes, alligator dress shoes, crocodile loafers, alligator loafers, crocodile sneakers, alligator sneakers, men’s alligator shoes, alligator boots, crocodile boots, BRUCEGAO alligator shoes for sale.